When I was a child in my place more emphasis was on the crib scene, the real reason for Christmas and very few people used to have Christmas tree. But now the trend has changed there too so many Christmas tree in shops and everywhere. I still remember how we used to sow the mustard seeds in the mud and waited for the seeds to sprout. The mustard grass bed would be the initial set up of crib. We used to make the Nativity Crib scene on the Christmas eve and place baby Jesus in the manager before leaving to Christmas Midnight Mass. Good old memories! DIY nativity scene and Nativity ornaments in the past years. We also have a book THE FIRST CHRISTMAS-STORY OF NATIVITY WITH 4 SIMPLE JIGSAWS . My daughter loves puzzles and the book has four jigsaw puzzles with story of Jesus Birth. 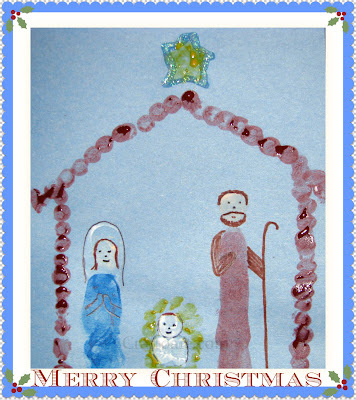 I got the idea to make thumbprint nativity card when I was checking my blog stats. 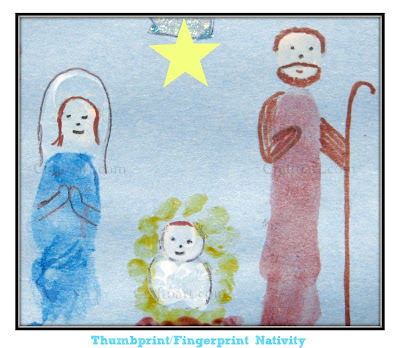 There was a search keyword "Thumbprint Nativity" that led to my blog. 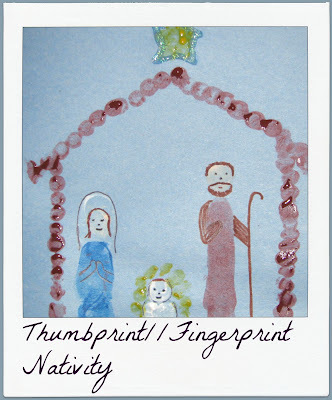 From last year I had been thinking of making thumbprint nativity cards for grandparents. Finally we made it. Body: Using a paper, make half finger impressions as shown to create the wrapped baby effect. Make finger print with yellow paint for hay around the baby. For the manager make brown finger prints. For the Stable and star make finger print impressions in the shapes. After the prints are dry make features for Mother mary, St.Joseph and Baby Jesus. CJ and I made the thumbprint nativity side by side. I told the instructions and she did it without my help. A group of international bloggers have joined together in the blog hop! we are so excited and thrilled to be part of the group! 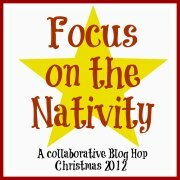 Do you have Nativity posts or interested in nativity crafts and ideas! Do link the posts below or check the list! Lovely. I really like simple ideas to celebrate a glorious occasion. Beautiful photos. I hope you have a Merry Christmas! Thank you Susan! Wish you Merry Christmas! Super cute and perfectly messy! I LOVE this!! Thanks for a darling idea. I have a new Saturday linky that I would love to have you participate in and share your ideas! Love this did it with my preschool class.